Posted on Sun, Mar 11, 2012 : 5:59 a.m. The owner of a local equine rescue is unhappy that most of the 18 horses seized from a Salem Township boarding facility in December have been returned to their original owners after the filing of animal cruelty charges in the case. Tricia Terry, who took care of the horses and nursed them back to health, said her facility has spent somewhere between $10,000 and $13,000 caring for them since their seizure. She worries that she will never get adequate restitution. She said the owners should have had to pay restitution before getting the animals back. 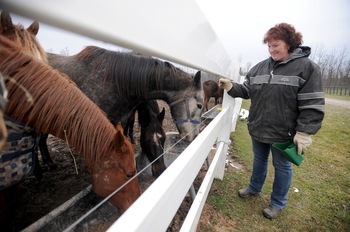 Tricia Terry, shown here with horses at her Starry Skies Equine Rescue and Sanctuary, fears she will never be reimbursed for the $10,000 to $13,000 she says she spent caring for horses seized from a Salem Township boarding facility. Although some amount of restitution will likely be ordered at sentencing, Terry said she’s not sure she will ever see any of that. She’s frustrated that the horses went back to the same owners who neglected them. She said she offered to waive restitution if the horses were relinquished to her so she could find better homes for them. Three horses remain at Terry’s Starry Skies Equine Rescue and Sanctuary in Scio Township, where they were taken after the seizure. Owners relinquished two of the horses, and one other horse is still there on a temporary basis. Two of the 18 horses had to be euthanized, one that had multiple health issues and one after being injured during transportation from Starry Skies to its new facility. The Humane Society of Huron Valley seized the horses in early December after finding them in varying stages of neglect at the Double Diamond boarding facility in Salem Township. The facility merely provides space for owners to rent, Humane Society cruelty investigator Matt Schaecher said at the time. It was the responsibility of owners to care for their animals, he said. In order to get the horses back, the owners had to agree to house them at a full-service boarding facility inspected and approved by the Humane Society of Huron Valley, said Steve Hiller, Washtenaw County chief deputy assistant prosecutor. The horses were returned last month, he said. Hiller said the horses will be monitored as the case proceeds and during any court-ordered probation, and the prosecutor's office will seek reimbursement for Terry. "We’re going to be trying to make sure that she gets restitution for the services that she provides," he said. Two of the owners have pleaded guilty to animal cruelty charges and two others have been arraigned, Hiller said. Cases are pending against two other owners, Schaecher said. Sarah Hundley, 42, Detroit, pleaded guilty to a charge of cruelty to an animal and faces sentencing March 27, Hiller said. She had originally been charged with cruelty to two to three animals but, under an agreement with the prosecutor’s office, was allowed to plead guilty to the lesser charge. Joe Leflore, 58, Detroit, also pleaded guilty to cruelty to an animal and faces sentencing March 27, Hiller said. Durrell Montgomery, 27, of Westland, is charged with cruelty to two to three animals, Hiller said. His next court appearance is April 4. Anthony Crummie, 32, of Detroit faces one charge of cruelty to an animal and is also scheduled to appear in court April 4. Cruelty to an animal is a misdemeanor punishable by up to 93 days in jail and/or a fine up to $1,000. A judge can also order the defendant to perform up to 100 hours of community service. Cruelty to two to three animals is a misdemeanor punishable by up to two years in prison and/or a fine of up to $2,000. A judge can also order up to 300 hours of community service. Mon, Mar 12, 2012 : 5:55 p.m.
Annarbor.com could do a good investigative article on this who horse neglect case if they cared enough. These owners just discarded and dumped these horses and then present themselves to the public as good guys. The public needs to know the truth. Is this how horsemen organizations should operate? I think not. Tue, Mar 13, 2012 : 3:02 a.m.
Do your part to identify these people, and link the source where you acquired this information, so that I know who to visit at the parade. Mon, Mar 12, 2012 : 4:02 p.m.
Why was my comment that mentioned another facebook page removed when Justaposter's was not? Look look up the other names on facebook and you will see photos of dangerously thin horses. If this was a self care facility, driving from Detroit and Westland is a lot of driving to feed your horse two times a day. Wed, Mar 14, 2012 : 7:46 p.m. I agree jose. This place was nothing more than a dumping ground. I've said it before, and I will say it again. If you cannot afford a horse, do not buy one. If you cannot afford boarding fees at a good barn, then work to fine your horse a good, forever home. If that cannot be found, do not send your horse to auction. It is a meat market, and the horses are transported in horrible conditions. If all else fails, you have no choice. Have the horse humanely euthanized. Mon, Mar 12, 2012 : 2:14 p.m.
Anthony Crummie's facebook page shows him as a owner/partner of Motor City Horsemen. Mon, Mar 12, 2012 : 5:43 a.m. Putting aside the fact that the horses were returned to their neglectful owners... I would be interested to know what happens if cats or dogs are seized from their owner and then the court awards the animals back to the owner. Does the owner have to pay the humane society for caring for the animal? I know if your dog or cat is picked up as a stray and taken to the humane society you have to pay an intake fee and a daily boarding fee in order to get your animal back. Seems like a similar situation to me. Mon, Mar 12, 2012 : 2:39 a.m.
Point your anger at The Black Horseman's Association. The horses belong to them. They are the ones that ride in The Thanksgiving Parade every year. aawolve, sorry to be the bearer of bad news but it is a fact. I believe it is time for this information to come out and hopefully the organization can police their own, so to speak. Three dead horses were found on that property, in addition to the ones that were seized. This has nothing to do with them being black, just cruel. Mon, Mar 12, 2012 : 4:25 a.m.
justcurious: Thank you for the information on the ownership of the horses. Is there anything we can do as concerned animal lovers, to make it publicly known that this &quot;group of people&quot; have done such harm to the horses? Like a petition or something? What a shame to hear of this going on. Mon, Mar 12, 2012 : 3:48 a.m.
Do you have a link to that info please? And why do I feel that if it was &quot;The White Horsemen's Association,&quot; that annarbor.com would have already told me. Sun, Mar 11, 2012 : 11:02 p.m. This is so stupid on the Judge's part! We are in crisis finding ways to get animals taken &amp; cared for now! The County is trying to Cut payment to the Humane Society to &quot;save&quot; money when all of the welfare groups are hard hit by rising costs and severely declining payments from the public. So the Judge says it's ok to take the animal but not pay the person who has supplied care at their expense! I wonder if they will let us get our cars out of impoundment without pay for the tow or costs of storage! After all we haven't been convicted of illegal parking yet! Same principle, right? Sun, Mar 11, 2012 : 10:47 p.m.
Sun, Mar 11, 2012 : 10:16 p.m.
A judge makes an important decision. Who is that judge? Maybe the Detroit News has more details. Sun, Mar 11, 2012 : 7:48 p.m. Contrary to popular belief, most horse owners are not wealthy. Why they are being returned to their abusers is a mystery to me. If these people had cared about their horses, they would have seen to it that they were well-fed and healthy at the so-called co-op. Sending them to a &quot;full-service barn&quot; (If they can afford that) just means the horses will be dumped on another barn, never visited...receiving no exercise...and having no &quot;person&quot;. There are also a lot of &quot;full-service&quot; barns that are unsafe, unsanitary, have bad fencing...etc. These barn owners could care less about the horses' welfare. However, they do want that board check paid on time. I am very lucky to board my horse at a MORE than &quot;full service&quot; barn. The owners love and care for my horse, as much as they do their own. I'm not going to say where that barn is...We do not want these people here. I am sure most reputable barn owners would agree. NOT at MY barn. Sun, Mar 11, 2012 : 7:32 p.m.
How can they do that?! Return an abused horse to its abuser? Please continue to let us know who these people are...I don't want them at my barn. Mon, Mar 12, 2012 : 6:24 p.m.
@jns You are absolutely correct. I hope these people do not have children. Mon, Mar 12, 2012 : 2:25 a.m. Happens in human households as well. Kind of scary what we do to people we do to animals. Maybe we all should take a step back? Sun, Mar 11, 2012 : 6:28 p.m.
Yeah, I am with most people here, but I don't understand how a animal rescue is financed. Why are the animal abusers not responsible for the bills, if they would have had to pay for maintenance if the horses anyway? Can someone explain why they aren't responsible to pay the rescue for the bills while the horses were in custody? Sun, Mar 11, 2012 : 5:09 p.m.
Sun, Mar 11, 2012 : 5:12 p.m. The county could not send them to auction while the legal case was still active, therefore someone would have needed to care for the horses in the meantime. Thanks you for being in animal rescue. It's a neverending job with no pay but endless rewards. Sun, Mar 11, 2012 : 5:06 p.m.
OK, who is the judge? And can we remove this judge from the bench? This is such a nut job I am also very upset to be reading this. ASPCA would make sure the animals would never return to the place of such torture. Wow, a sad thing to read. Sun, Mar 11, 2012 : 4:39 p.m. Throw the book at all the perps. There is no excuse for cruelty to animals. None. Sun, Mar 11, 2012 : 4:37 p.m.
Again, no photos of the four perps. Why? Mon, Mar 12, 2012 : 3:37 p.m. So, should we besiege the parade with letters and complaints about this organization? It might get them to take notice of what is really going on. They may not know. Mon, Mar 12, 2012 : 3:08 a.m.
Mon, Mar 12, 2012 : 2:36 a.m.
Just watch the next Thanksgiving Parade and you will probably see them riding with their Association. Sun, Mar 11, 2012 : 3:30 p.m. The judges should absolutely order restitution and do everything possible to enforce it. Had Starry Skies not stepped up and offered to house the horses, Washtenaw County would have had to board them somewhere at their own expense until the legal case was settled. They were fortunate, as was HSHV, that such a group was there to help out. I hope the right decisions are made and Ms. Terry's group is reimbursed for their expenses in full. Sun, Mar 11, 2012 : 5:39 p.m.
You highlight the problem here. The law does provide that if the animals are in the care of a licensed veterinarian or humane society as a result of seizure, then there is a lien on the animal, and the judge may order that expenses be paid before the animal is returned. Ms. Terry volunteered to take the animals and therefore has no lien. If the humane society or the county had incurred these costs then the judge could order restitution. But neither the county or humane society has the facilities to care for the animals. I suspect that if the county had seized the animals and then contracted with Ms. Terry for their care, then the county would have the lien. Sun, Mar 11, 2012 : 3:59 p.m.
&quot;Had Starry Skies not stepped up and offered to house the horses, Washtenaw County would have had to board them somewhere at their own expense until the legal case was settled. &quot; Which would have been the right way to do it (perhaps they could have contracted with Starry Skies to perform this service?). Sun, Mar 11, 2012 : 3:19 p.m. This sounds like it's about a shaky or no contract - somebody messed up. She fed them back to health over three months. Either she had a contract or not - and certainly keeping the horses would be a nice payment for three months of horse chow. Presumably when she accepted them, she had an agreement to be paid, keep them as restitution or what - do it for free? While keeping the horses makes sense to an animal lover whats this to be about who &quot;deserves them more&quot;, it also sounds like much more compensation then necessary. Sun, Mar 11, 2012 : 2:58 p.m.
Like nuseph says you don't have to sign a contract when your car is towed but you have to pay for the towing plus storage fees. Sun, Mar 11, 2012 : 3:07 p.m. But the tow charges are written into the law. No similar provision exists for horses. If Ms. Terry wants restitution then she should work to have the law changed. Sun, Mar 11, 2012 : 2:28 p.m. They should have paid before they could pick them up. Just like repo, get with it, this is unfair anyway you look at it, but especially to the horses who have no say. Sun, Mar 11, 2012 : 2:44 p.m.
Maybe annarbor.com could interview them and see what they say. Sun, Mar 11, 2012 : 2:20 p.m.
Sun, Mar 11, 2012 : 1:43 p.m.
Ms. Terry is an attorney and she knew fully well when she accepted the animals that it was voluntary. It may be unfortunate that she spent her money but I know of no provision in the law that allows her to receive restitution in this circumstance. Sun, Mar 11, 2012 : 4:34 p.m.
Nuseph, you are absolutely right. Who is responsible for the horses' care in a seizure situation like this? It would make sense for it to be the owners' responsibility keeping in mind that they are the ones who created the whole situation through their abuse and neglect of the animals. If it's the government's responsibility, that leaves the burden on the taxpayers. As a tax paying citizen, I don't want to pay for someone else's crime only for the horses to be returned to those same people after they've been nursed back to health. Horses can't be seized without somewhere for them to go. Should they suffer in the care of those facing cruelty charges? Rescues can't help animals without funding from somewhere. I'd bet that the HSHV has a hard time finding board and care for horses in danger in the future. Sun, Mar 11, 2012 : 2:49 p.m. I agree nuseph. The problem is that the judge has to follow the law. Sun, Mar 11, 2012 : 2:23 p.m. It sounds like most of her concern is that the horses are going back to the people who neglected them in the first place. As for the money, it's fine to talk contracts, but if you consistently treat people like this, then you're only going to discourage those people and others from stepping up to help out. Or forcing the government to pay for it. Sun, Mar 11, 2012 : 2:16 p.m.
That certainly puts a perspective on my initial thoughts. Sun, Mar 11, 2012 : 1:49 p.m.
People shouldn't expect restitution for voluntary aid. Being a lawyer if she didn't like the process she should work to change it. She knows the rules and what's wrong with them first hand. Sun, Mar 11, 2012 : 1:42 p.m. I think the judge should go live in the barn with the horses for a while. Bad decision by a bad judge. Sun, Mar 11, 2012 : 5:07 p.m.
Maybe all of them should live in the barn and the horses in the house? Sun, Mar 11, 2012 : 1:34 p.m.
Bottom line here... If there was no signed contract between the animals' owners and/or the entity that seized the animals that the rescue organization would be paid for housing and caring for the horses, why would she expect that she is going to be paid? This isn't an issue of &quot;right and wrong&quot;, it's an issue of contractual business agreements (or lack thereof). Sun, Mar 11, 2012 : 3:57 p.m.
you know, that's a good analogy. However, I suspect you would find a paper trail of agreements with the property owner/city/municipality and appropriate laws that allow for the collection of those fees by the towing company. I don't think that's the case here. Sun, Mar 11, 2012 : 2:19 p.m.
What happens when your car gets towed and you have to pay storage fees to the tow company? Did you sign a contract? Sun, Mar 11, 2012 : 1:06 p.m. This is just so wrong. I don't understand how the individuals could get their animals back period. And, where are they now and who is supervising how they are being taken care of. I surely hope that restitution is paid, but not hopeful. In the meantime, I can say that the horses were well tended, loved, and did well when they were at the sanctuary. Keep up the good work with the rest of the horses that have been taken n.
Sun, Mar 11, 2012 : 12:59 p.m.
That is such B.S. What is wrong with our Judges? Sun, Mar 11, 2012 : 12:58 p.m.
Good luck with that restitution order. I have yet to see a nickel of restitution from when I was victimized going on three years ago. Sun, Mar 11, 2012 : 3:01 p.m.
My son was awarded restitution back in 94 of 6000 and so far has gotten about $100 if that much and yet the courts don't do a thing about it.